KANSAS CITY, Mo. — When he first learned of the news Monday, the Rev. Dr. Andrew Thompson immediately turned on his TV. 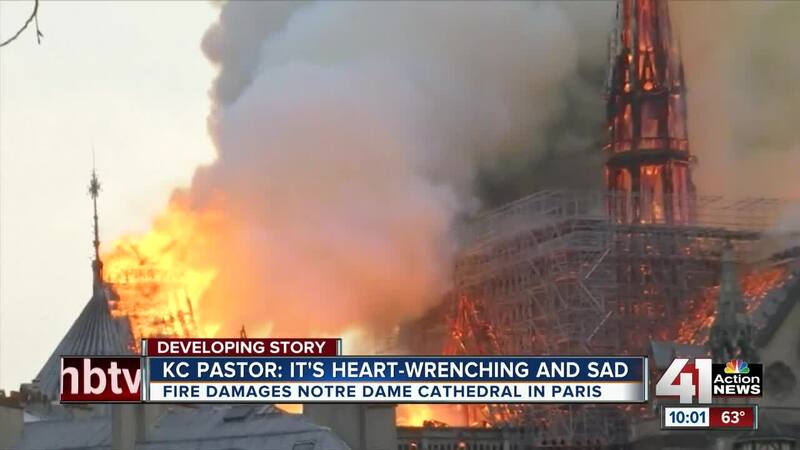 To his disbelief, he watched as flames tore through the iconic Notre Dame Cathedral in Paris — the fire caving in the roof, surrounding the spire and finally knocking it over. "The whole idea of the spire reaching up into heaven, reaching there and somehow touching God," said Thompson, associate pastor at Our Lady of Perpetual Help Catholic Church in Kansas City. "Now, you're not able to touch God because it's fallen." The Notre Dame Cathedral is located on an island in the Seine River in the heart of Paris. It is one of the world's most visited tourist destinations, attracting around 13 million people each year. "There is no question that Notre Dame and the Cathedral are one of the iconic spots of Paris," said Kathy Sudeikis of Acendas Vacations in Mission, Kansas. By early Tuesday morning, Paris officials said the fire was under control and that several invaluable artifacts had been rescued. "All you can pretty much do is pray and hope. And put your confidence in your authorities and firefighters and first responders," Thompson said.